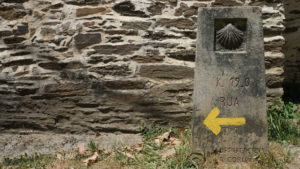 "This was our 5th year of walking part of the Camino de Santiago and now almost 140 pilgrims have enjoyed the experience. Partnering with CaminoWays to arrange airport transfers within Spain and hotel accommodation for those in our group who do not wish to use albergues/hostels has always been a pleasure. They are so professional and so pleasant to deal with, making my job as organiser so much easier. 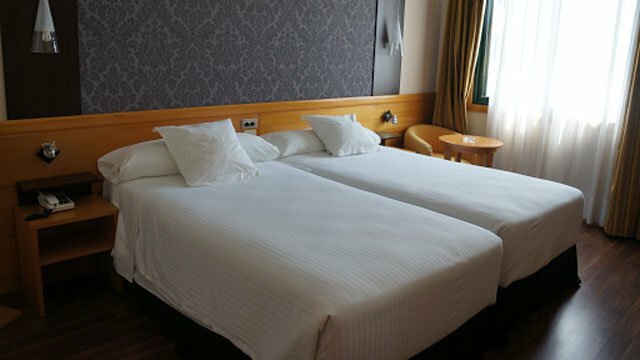 CaminoWays has never failed us in providing good quality accommodation and the transport companies they engage have always proved reliable. Thank you once again for your help in 2018." 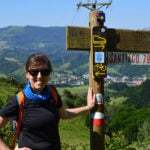 Camino primitivo - organised by CaminoWays. Excellent organisation, timely and reliable. Very professional and kind personnel.Value for the money - accommodation and everything else were excellent. The last stretch of the Original Way or Camino Primitivo is much easier than the first half, from Oviedo. It takes 6 nights to complete, walking over 97km. This stage starts in the fantastic city of Lugo, home to the best preserved Roman wall in Europe, stretching over 2kms wrapped around the old town. 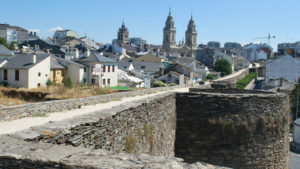 Apart from its famous wall, a UNESCO World Heritage Site, Lugo is also known for its good food. Many bars in town will serve free ‘pinchos’ when you order a drink. From Lugo, the Camino Primitivo continues towards Santiago de Compostela across peaceful forests and farmland, following old Roman paved roads and over pretty medieval bridges.This section joins the final stretch of the French Way, the most popular Camino route, in the lively town of Melide where you should try Galicia’s most classic dish: octopus. If you are travelling in October, make sure you catch the traditional San Froilán festival in Lugo. This route has excellent reviews with many 5 star ratings. The Camino leaves Lugo by the Cathedral and through the oldest gate of the city wall which is called Porta Miñá (referring to the Miño River). From here you will walk to the quarter of San Lázaro and cross the old Roman Bridge. After a few kilometres you will pass a national monument and museum called Santa Eulalia de Bóveda, housing some of the most fascinating early medieval paintings of the entire Iberian Peninsula. The trail heads to San Román da Retorta through farms and woodland. 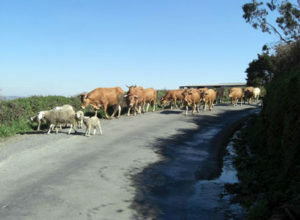 The Original Way follows ancient tracks still very much in use today, connecting many small country villages and hamlets in the area, such as Seixalvo, Xende, Ferreira and Merlán. 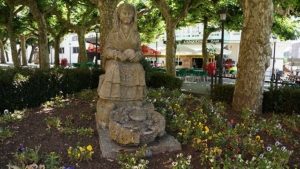 The route continues through Toques and into the historic town of Melide in the province of A Coruña. This is where the Original Way or Camino Primitivo joins the French Way. You will notice the volume of pilgrims will be much higher from now on. You should take the opportunity to sample ‘pulpo’ (octopus) in one of the many ‘pulperías’ (octopus restaurants) in town and grab a few ‘melindres’, Melide’s traditional aniseed cakes. 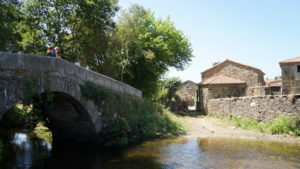 As you leave Melide you will be now walking with other pilgrims on the Camino Francés (French Way), following forest tracks, crossing many pretty streams and meadows, on your way to the village of Boente where you will see the Santiago Church. You will pass the picturesque village of Ribadiso on your way to today’s destination, Arzúa. Arzúa is in the heart of dairy country, make sure you try some of the local cheese. Worth visiting the church of Santa María and the church of A Magdalena in town. Today’s Camino trail takes you mostly across peaceful forests and small hamlets. Along the way you will pass the chapel of Santa Irene, home to interesting St James statues. This stage of the Camino continues along serene country roads. Your stop for the night is the town of Pedrouzo where you can spot a few traditional ‘hórreos’ (granaries) and granite farm houses. 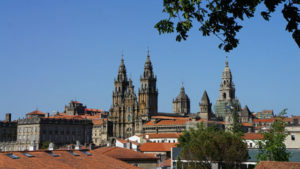 This is the final walking day of your Camino journey to Santiago de Compostela. From Pedrouzo the route takes you to Amenal and on to Lavacolla. Lavacolla name comes from the fact that pilgrims used to wash themselves in the river here before reaching Santiago. The trail to Monte do Gozo or ‘Mount of Joy’ is lined with ever-present eucalyptus trees. The hill itself is topped with an enormous sculpture commemorating the visit of John Paul II to Santiago. From here the Camino descends to Santiago de Compostela. You will enter Santiago by the bustling Rúa de San Pedro and into the old town by Porta do Camiño. You have arrived! You have arrived in Santiago de Compostela! After visiting the cathedral and recovering from your walk, take time to explore this gem of a city, small but vibrant. Santiago’s UNESCO listed old town will enchant you. Here you will find not only pilgrims but also locals and students, enjoying a few bites over a glass of wine in the many bars, restaurants and cosy cafes. Madrid Barajas Airport 500km: There is a bus route from Madrid airport to Lugo, three times a day, taking 6h30-7h30. See: www.movelia.es. Santiago de Compostela Airport 12km: There is a shuttle bus from Santiago city centre to the airport, departing every 30min. Bus stops include the bus station (Estación de Autobuses), the train station (Estación de Ferrocarril) and the city centre (Plaza de Galicia). See www.empresafreire.com. Porto Airport 210km: There is a direct bus connection between Santiago (Estación de Autobuses) and Porto airport once or twice a day (taking 4h or 6h). See www.alsa.es.